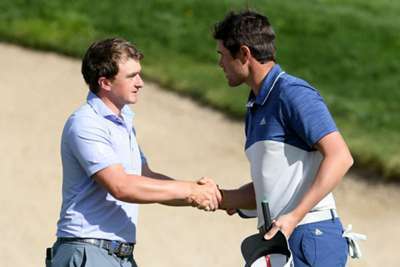 Paul Dunne's three-shot lead was cut to one at the Open de Espana on Saturday as home favourites Nacho Elvira and Jon Rahm made up some ground. The Irishman, whose sole European Tour victory came at the British Masters last year, shot a four-under 68 to move to 17 under at the Centro Nacional de Golf. Elvira began the day three behind but gained two strokes thanks to a 66, while world number four Rahm made up one shot by matching Elvira's round. Rahm is joined on 15 under by Henric Sturehed, one shot ahead of Brett Rumford (66), with Andy Sullivan moving to 13 under thanks to his best-of-the-day 65. Dunne was three under through the front nine thanks to successive gains at five, six and seven and he picked up another birdie at the 12th. The only blip on his scorecard was a bogey four at the 17th, where his ball ended in the water, but he reclaimed that dropped shot immediately on the par-five last. "It's probably the best my swing has felt, the best my body has felt like it's been moving, but I just didn't pull the shots off," said Dunne. "There was a lot of grinding there on the back nine but I'm happy to get in with four under. I probably wouldn't have taken it at the start of the day but given the shots that I hit, I'm pretty happy with it leading into tomorrow." "Everything feels good, the game feels great, I just didn't pick shots. I hit a few shots without having a shot in mind so that's something to work on for tomorrow. Hopefully I'll have a good day. I'm confident about tomorrow."